A KidsFest must-see for all ages, Daniel Wishes and Seri Yanai’s Shadow Kingdom is produced by Mochinosha Puppet Company playing at the Toronto Fringe Festival. While I was in awe of the performance, I noticed the entire audience seemed equally captivated by Shadow Kingdom. The story revolves around Minerva, who is glued to her phone. She doesn’t want to sleep and impatiently checks her phone again and again for messages. This leads to her phone being taken by Hypnos, the God of Sleep. Minerva decides to get her phone back and thus ensues a zany, colourful adventure. Minerva meets Owl who, like Minerva, hates sleep. He takes Minerva on a treasure hunt. When Minerva realizes what Owl’s true intentions are, it’s too late to stop him — he wants everyone to stay awake forever and he releases nightmares. Minerva eventually has to make a decision to either keep her phone or help save the city. I like the moment when one of the animal creatures informs her that “every human child is a hero”. Daniel Wishes and Seri Yenai give voice to Minerva as well as all of the other characters that she meets. Nearly 400 original hand-cut puppets were used in the production. All of the artwork is intriguing. Some of my favourite moments include a tree turning into a bird, and the opening sequence which felt like a comic book coming to life. Kids especially loved the character of DJ Slug and every time he appeared they called out “DJ Slug”, imitating the voice Wishes uses for the character. There were many moments from the show that kids verbally responded to. 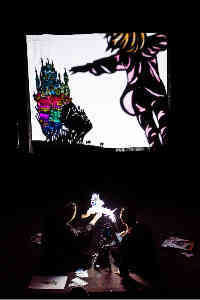 I appreciated that before the show began Wishes and Yenai showed the kids in the audience how they can make their own shadow puppets at home. While I would have liked Minerva to have been even more the hero that she was set up to be, and for there to be more distinction in the personalities of each character, I appreciated how entertaining and artistic Shadow Kingdom is. I think it’s really important for kids to have fun and be entertained. Shadow Kingdom allows for this and also manages to impart a message about the importance of sleep and putting away one’s phone in a way that doesn’t feel too much like a lesson. It’s not often that there’s a chance to see great shadow puppetry. I recommend this show for both children and adults as there’s a lot of content for all ages to enjoy. Photo of Daniel Wishes and Seri Yanai by John Matthews.